Why are some nail polishes so damn hard to capture on screen? In real life, they can be as pretty as a flower… but through my camera lens? We be talking cauliflower. Powder Rooms sent me this polish to photograph for their site late last year, back in the murky depths of dark nights and well, even darker days. It made for a frustrating assignment. 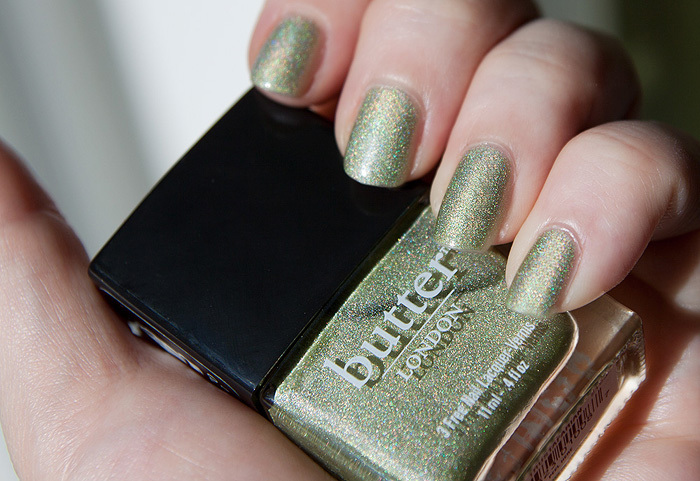 Butter London’s Trustafarian basically only sings in the sun, it needs strong daylight like I need intravenously feeding Pepsi Max. Ahhh, you beauty. You pain in the arse beauty. It applies with three smooth coats and dries quickly enough not to give me any major application issues. You can see that the holographic effect, although fairly subtle, is still super-pretty in a pixie-esque, twinkly kind of way. Do you need this in your life? Possibly, particularly if you live in a country whose weather patterns consist of more than just perma-drizzle. Oh my gosh! That colour is so pretty and if these photos aren’t doing it justice I can only attempt to imagine it’s real life beauty! Might just have to splash out and grab myself one. I love it! I think I DO need that in my life! I’ve never tried Butter London nail polish before, I’m very curious. Lovely review! Ah this is gorgeous. I can definitely see the shimmer effect in the second photo.